The exhibition showcases a long history of excellence in female-created art and proves that women could and did contribute to the evolution of style, technique, and exploration in the world of art. Meet curator Maurine St. Gaudens at the Pasadena Museum of History and enjoy the gallery. The Opening Reception at the historic Blinn House of the Women’s City Club of Pasadena includes an illustrated talk by Craftsman Weekend exhibitor and master artisan Theodore Ellison. 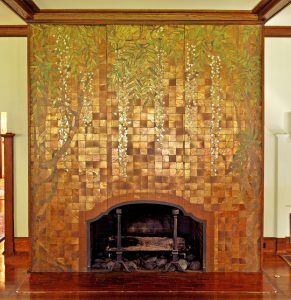 He will trace the introduction of mosaic in the buildings of progressive American architects at the turn of the twentieth century and will include the work of Giannini & Hilgart, the Chicago firm responsible for the leaded glass and mosaic fireplace at the Women’s City Club. Wine and hors d’oeuvres will be served at 5:00 pm with the lecture beginning at 6:00 pm. 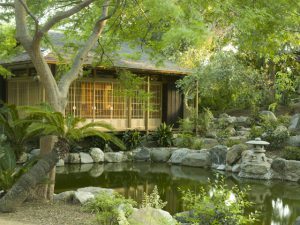 Experience a traditional Japanese tea ceremony in the Storrier Sterns Japanese Garden’s authentic teahouse. 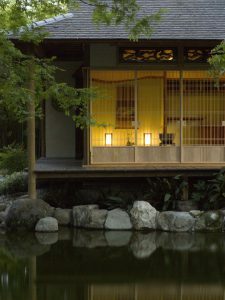 A highlight of the garden, the tea house is romantically situated overlooking a quiet pond and winding paths that lead to various gathering points and vistas, under spreading sycamores and old oaks. DISCOUNT FOR EVENING RECEPTION TICKETS: Please note that there is a $10 discount to purchase both the Tea Ceremony and Evening Reception tickets. Select "Combined Tea Ceremony and Reception Ticket" when you check out for savings. This unique, authentic garden is a hidden treasure. It was previously a private space reserved for an aristocratic Pasadena couple but has since been restored and opened for the public’s enjoyment. Enjoy this catered reception and tours of the garden at one of Pasadena Heritage’s biggest fundraisers. The night will feature a performance by international recording artist Yukiko Matsuyama, whose accolades include performances with Shakira at the Latin Grammy Awards and Motown Legend James Gadson, and recording with Paul Winter on his Grammy Award Winning album, 'Miho: Journey to the Mountain' (Best New Age Album).